Have I mentioned I have a wonderful husband? 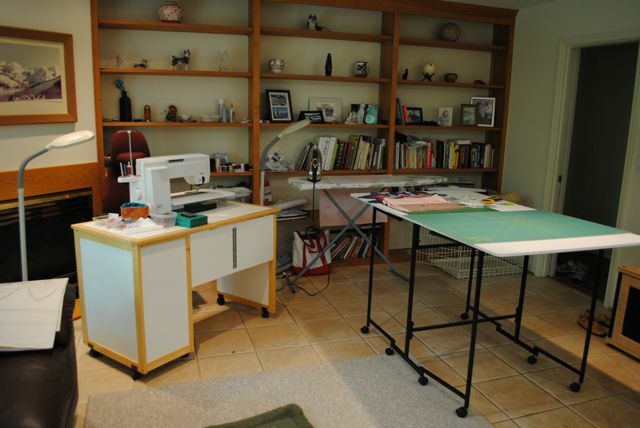 He patiently shares our family room with my sewing table, ironing board, and cutting table. After my return from my last trip, he observed that it might be possible to rearrange some of my sewing paraphernalia to get more light. 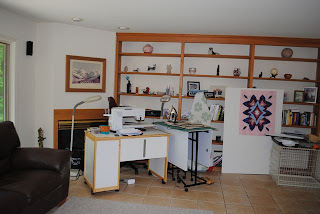 I rearranged the furniture a bit last weekend and here is the result. The cutting table and ironing board fold up when not in use which actually improves the flow of husbands, repair men, and pets around my little oasis when I am not using it. Note that I have one of my portable design walls in this last photo. I am finally back to stitching! Here is a closer view of how my crystal quilt is evolving. The border(s) are not yet added. 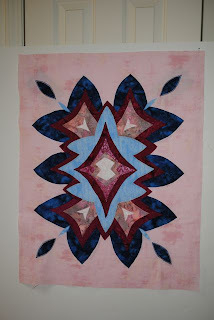 Next I will be working on decorative stitching.